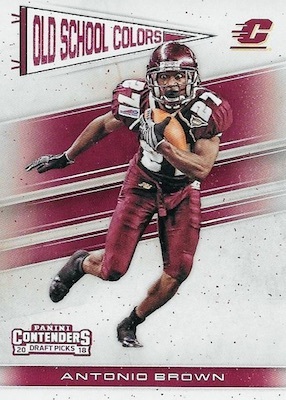 Applying NCAA images to the popular Contenders line, 2018 Panini Contenders Draft Picks Football calls out to collegiate collectors. Every pack promises one autograph, and signers include top incoming rookies and established NFL stars. 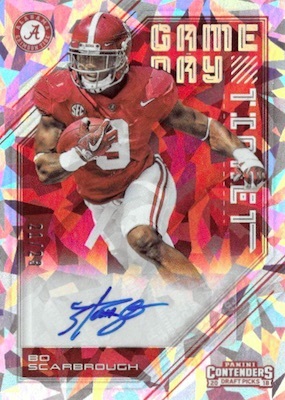 Similar to 2017, and a major plus for rookie collectors, select standouts from the incoming draft class are even treated to on-card signatures. 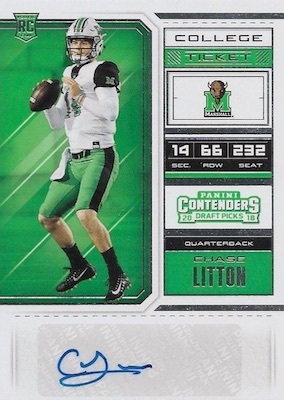 As the Contenders brand typically works, Season Ticket is the official name for the base set which showcases college images for NFL players. Parallels include Cracked Ice Ticket and the one-of-one Printing Plates. Of course, the inserts are also a college affair. Game Day Ticket falls two per pack, while the School Colors, Old School Colors and Collegiate Connections cards each come one per pack. However, most fans look to the early-season set for the autographs, which are in good supply. 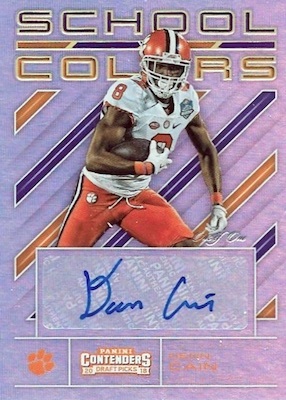 Leading the way in the 2018 Panini Contenders Draft Picks checklist are the signed College Ticket subset cards. 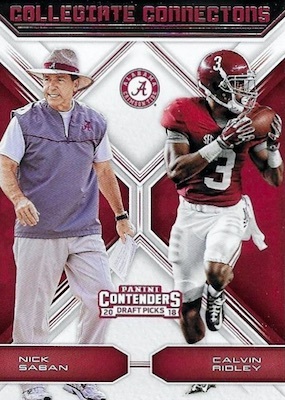 These are the NCAA version of the popular Rookie Ticket cards. 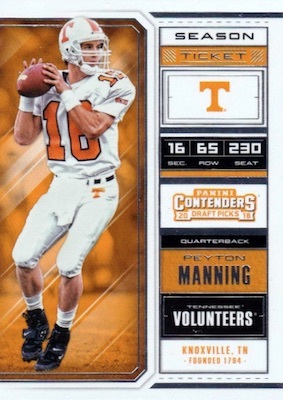 Rare editions can be found via the College Ticket parallels: Bowl Ticket (#/99), Cracked Ice (#/23), Playoff Ticket (#/15), Championship Ticket (1/1) and Printing Plates (1/1). First-year prospects are also included in Game Day Ticket Signatures and School Colors Signatures. In addition, Collegiate Connections Signatures pairs either two incoming rookies or one rookie and one former star that played at the same school. Providing more established names, the Season Ticket Signatures insert is an autographed take on the base cards, featuring all-time greats like Eddie George, J.J. Watt, John Elway and Peyton Manning. Short print details noted on above tab. TICKET PARALLELS: Draft Blue Foil, Draft Red Foil, Bowl #/99, Diamond #/49, Cracked Ice #/23, Building Blocks #/15, Fame #/5, Championship 1/1, Printing Plates 1/1. 24 cards. Shop autographs on eBay. Short Prints: SP = 250 copies or less, SSP = 50 copies or less. TICKET PARALLELS: Draft Blue Foil SSP, Draft Red Foil SSP, Bowl #/25, Cracked Ice #/23, Playoff #/15, Championship 1/1, Printing Plates 1/1. 24 cards. Every player has A, B and C versions. Full variation guide. All cards are SSP (50 or less). 151 cards. Shop autographs on eBay. TICKET PARALLELS: Draft Blue Foil SP/SSP, Draft Red Foil SP/SSP, Bowl #/99, Cracked Ice #/23, Playoff #/15, Championship 1/1, Printing Plates 1/1. See full breakdown of Red/Blue Foil SP/SSP parallels on above tab. All subjects not found in Blue/Red parallels. View the spreadsheet for full details. 19 cards. All cards are SSP (50 copies or less). TICKET PARALLELS: Draft Blue Foil SSP, Draft Red Foil SSP, Bowl #/99 or #/25, Cracked Ice #/23, Playoff #/15, Championship 1/1, Printing Plates 1/1. 31 cards. All cards are SSP (50 copies or less). TICKET PARALLELS: Bowl #/99 or less, Cracked Ice #/23, Playoff #/15 or #/5 (No Bo Jackson*), Draft Blue Foil #/5, Draft Red Foil #/5, Championship 1/1, Printing Plates 1/1. 17 cards. All cards are SSP (50 copies or less). PARALLEL CARDS: Cracked Ice #/23 (No Helton/Darnold**), Championship 1/1. 24 cards. All cards are SSP (50 copies or less). TICKET PARALLELS: Bowl #/25, Cracked Ice #/23, Playoff #/15, Blue Foil #/5, Red Foil #/5, Championship 1/1, Printing Plates 1/1. View the 2018 Panini Contenders Draft Picks Football checklist spreadsheet. For all short print cards noted below, SP = 250 copies or less, SSP = 50 copies or less. PARALLEL CARDS: Blue Foil SSP, Red Foil SSP. 24 cards. Each player has A, B and C version. All 3 are SSP. The product looks great as usual but I’m giving it a low rating after seeing this checklist. For Ohio State being one of the best schools to send players to the draft every year, there is absolutely no love for them in this year’s checklist. I guess I hope if I’m lucky enough to hit any they’re worth more for being non existent. Any info on the A,B,& C Variations on this product??? I’d like to know if one variation is more rare than the others???? No word yet, unfortunately. I know last year that all three versions were SSP, which meant each had 100 copies or less. 3 packs at $25.00 per pack and the three autos I hit might bring $15.00 total if lucky. Heavy on lineman and not so on stars that you would actually want to pull but then I have NEVER had any luck with any Contenders product. I need to learn to leave this product alone, regardless of sport. Bought two boxes, one had a redemption for a Barkley Playoff ticket. I am pleased. Nice set! Love cracking a couple of boxes before the draft to add some extra suspense on draft night. Configuration is similar to last year, but I like this year’s design a bit better. Of course, it helps getting both a Cracked Ice Veteran and a Cracked Ice Rookie Redemption Variant in the first box I opened, so I may be biased. Nice to see the coaches added to the base set as well. Got what appears to be an SSP of Mason Rudolph but which version it is I cannot tell, and your checklist offers scant enlightenment. Not numbered, not red, not blue, not purple, not green, not gold. Some weird orange. Ideas? We have no way to distinguish the versions and all RPS autographs for Mason Rudolph are listed as SSP. Bought one pack, $24.95, and pulled a Baker Mayfield auto card #124. No serial #. Is this a base auto? How do I tell if it is a SP or SSP? Normally there is a trick or designation to tell the difference, but we don’t know of any for 2018. All the Mayfield College Ticket autographs are SSP. There is a way to distinguish the Variations. On the back of the cards there are 2 Parallel lines just below the picture that run from left 2 right. If in between those 2 lines there are no breaks I’m guessing that’s the regular version. If there is one break in the line it’s version A, 2 breaks Version B and 3 is version C. If u look at the back of the 4 different Darnolds for example u should be able to see what I’m talking about pretty easily. Good eye, Jake. That seems to check out based on a few players I looked at. These are nice cards but could anyone explain to me why the blasters are so cheap with two autos per box as to the hobby boxes with six? John, the hobby boxes contain top value autographs including Cracked Ice and all of the lower serial numbered cards. 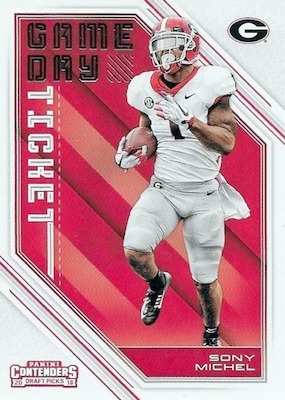 I’ve never personally seen anything lower than a /99 Bowl Ticket in a retail blaster box. That said, the blaster boxes are one of the better values in retail as you can still draw some nice 1st and 2nd round autographs, including the Blue and Red Foil short prints. One caveat is that I tend to personally draw more point redemptions in retail than I do in hobby, which I’m going to guess is not a coincidence. The hobby boxes are totally worth it, valued at $20 at Walmart, guarantees 2 autos per box on average. Great product. Plenty of pretty spectacular prospects and options for the collector. Noticed Jaylen Samuels isn’t listed in your College Ticket variation list. He has a few doesn’t he? We opened a Contenders Draft Pick box and pulled the Jim Plunkett 5/5 card. Bought the box at Walmart for 19.95. Also had a Austin Proehl signed card in there. All in all not to shabby. 2019 contenders draft picks release date? I don’t see it anywhere. I’ve bought 15 boxes and every single autograph insert is an undrafted player. this set is pure garbage. 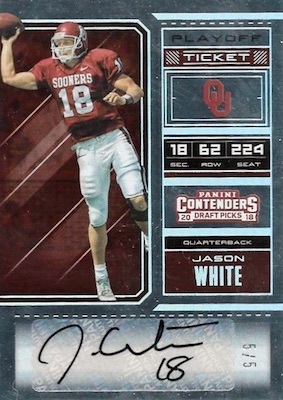 2018 Panini Contenders Football Hobby Box Draft Picks - 6 Autos - Mayfield ? 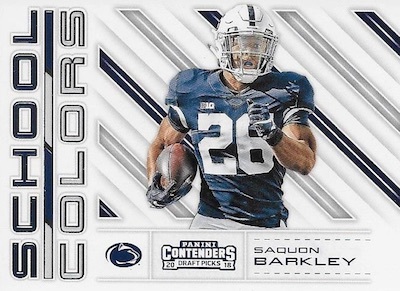 2018 Panini Contenders Draft Picks Collegiate Football Hobby Box. Sealed!